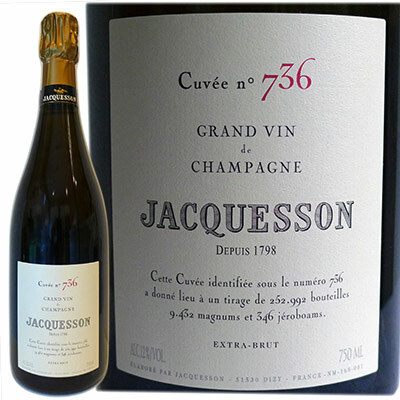 While most non-vintage Champagne is made up of several individual vintages blended with uniformity in mind, the aim of Jacquesson’s 7-Series is to emphasize the best qualities of a given year. The new release of 736 is based on the 2008 harvest with about 34% of the blend made with reserves from 2007 and 2006. It’s composed of 53% Chardonnay, 29% Pinot Noir and 18% Meunier. The spring of 2008 was rather chilly and wet followed by a dry and cool summer. There was a relative shortage of warm days throughout the growing period but the grapes eventually ripened under excellent conditions with musts that were rich in sugar and having excellent acidity. 2008 is set to be the best year in Champagne since the superlative 2002. Because the Chiquet brothers thought Cuvée 736 tasted best at just 1.5 grams per liter of dosage it is thus labeled extra brut. I guess he likes it almost as much as we do. Stop by the shop this Saturday for a sample.